To date the most 3-point field goals made in an NBA game by one player is 13. This is one NBA record I expected to be broken and it just was. On November 7, 2016, Steph Curry made 13 threes in a 116-106 win over the New Orleans Pelicans. Curry made 13 of 17 threes in the game to break the NBA record. He scored 46 points in the game. On Fe​bruary 27, 2016, Stephen Curry of the Golden State Warriors made 12 three-point shots in a game against the Oklahoma City Thunder. Curry took 16 threes in the game so he made 75% of his three-point shots as he led the Warriors to a 121-118 win. Steph Curry scored 46 points in the game. On January 7, 2003 Kobe Bryant of the Los Angeles Lakers made 12 three-point shots against the Seattle Supersonics to set the record for most 3-pointers by a player in one game. Kobe made 12 of the 18 (.667) threes he took and finished with 45 total points in the game. Kobe Bryant has also had 9 three-pointers in a game 3 times and he also once had 8 three-pointers in a game. Though he is getting a little older Kobe is still a threat to break his own record. On March 13, 2005 Donyell Marshall of the Toronto Raptors came off the bench to hit 12 of 19 three-point shots against the Philadelphia 76ers and tie the record for most 3-point shots made in a game. Marshall would only make one two-point shot in the game and finished with 38 total points. 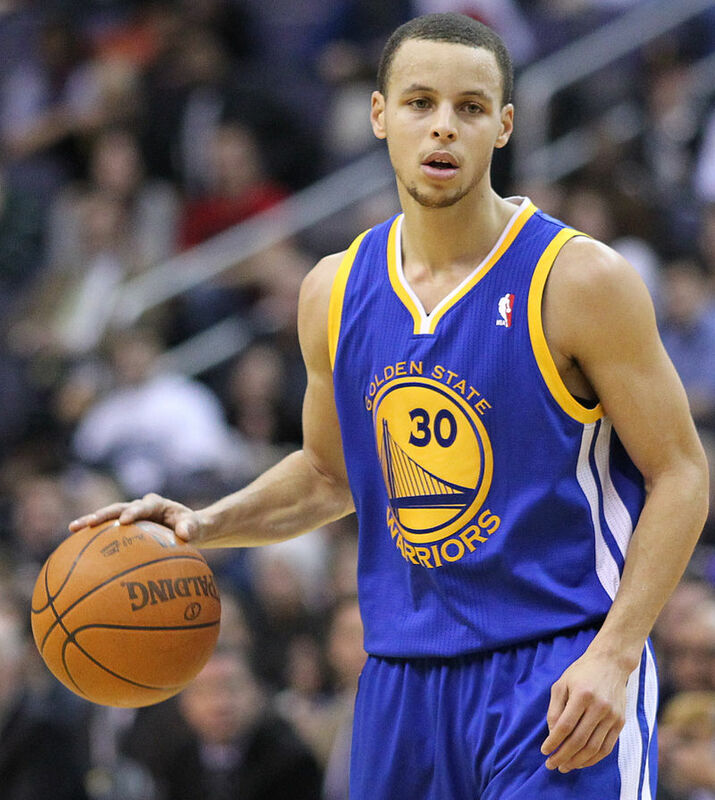 ​On February 3, 2016, Stephen Curry made 11 threes in a 134-121 win for the Golden State Warriors over the Washington Wizards. Curry finished the game with 51 points. On January 28, 2015, Kyrie Irving of the Cleveland Cavaliers made 11 threes in a 99-94 win over the Portland Trail Blazers. Irving scored 55 points in the game. With a little help on April 18, 1996 Dennis Scott of the Orlando Magic set the previous record of 11 three-point field goals in one game against the Atlanta Hawks. Beginning during the 1994-95 season the NBA moved in the three-point line to 22 feet from the basket to improve scoring in the league. The NBA moved the line back to its original distance after the 1996-97 season so Scott broke the record while the line was at 22 feet. Dennis Scott also broke the record that season for most 3-point field goals in a season with 267 (Ray Allen and then Steph Curry have since broken that record). J.R. Smith, playing for the Denver Nuggets, made 11 three-pointers on April 13, 2009 against the Sacramento Kings. Smith did not start the game for the Nuggets but came off the bench to make 11 of 18 three-point attempts and scored 45 total points in the game. On February 23, 2013, Stephen curry of the Golden state Warriors made 11 threes in a 105-109 loss to the New York Knicks at Madison Square Garden. Curry made 11 of the 13 threes he took in the game and ended up scoring a career high 54 points. Curry broke the NBA record for threes in a season in 2013 with 272. On March 8, 2013, Deron Williams of the Brooklyn Nets made 11 threes in a 95-78 win over the Washington Wizards. Williams made 11 of the 16 threes he took, and ended up scoring 42 points in the game.